YouTube's entry into the music streaming market certainly wasn't without a few raised eyebrows. First of all, Google (which owns YouTube) already has a music streaming service. Secondly, how is it going to handle all the unofficial music, remixes, parodies and lyrics videos? Or, what about spotty artist discographies, audio quality, or those independent and unsigned artists? So many questions. Now that the beta invites are out, and I've had chance to use it in real life, it's suddenly starting to make a lot of sense. Amongst all the fail videos and movie trailers, YouTube hides a digital warehouse full of endless undiscovered musical gems. Potentially more music than any other site could ever have. Let's back up a little. 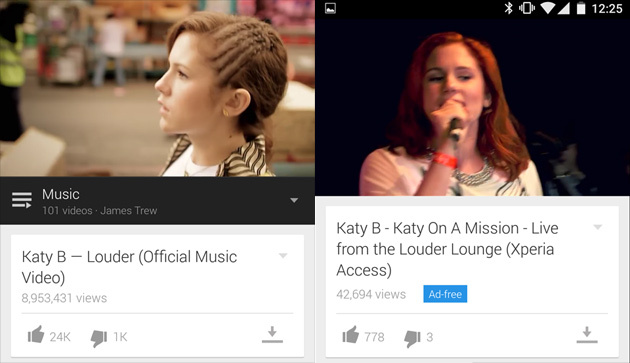 YouTube's Music Key is the video behemoth's new push into (you guessed it), music. They "key" features are: ad-free listening, the ability to play music offline and in the background on your phone (even when locked). For this, Google wants $10 per month. But, that also includes an account with Google's existing streaming service Play Music All Access bundled in. This caused some people to question the need for Music Key. After all, isn't all that music already on All Access? The short answer is: nope. Without even thinking about it, I've long been using YouTube to discover and bookmark music. It's exactly those weird remixes, those unofficial uploads and the sheer abundance of content you can't find elsewhere that gives the 'tube an edge over all the other services and their near-identical libraries. It occurred to me somewhere between this Hot Chip remix (available on Play and YouTube) and Dubbledge's not-for-purchase Lips 2 da Floor bootleg -- YouTube Music Key is the streaming service for people who don't like streaming services. Among the lesser-known music, some official videos (center) aren't yet included in Music Key. It's not just about the rarities, either. If your listening habits don't really fit into a radio-friendly 3-4 minute format, most modern music streaming services hold little of interest. For anyone with exotic taste in music, almost by definition, paid streaming services can't offer what you want: the unusual and the unreleased (although they do surprise me sometimes). YouTube, on the other hand, is the spiritual home of the unusual and unreleased. YouTube is the spiritual home of the unusual and unreleased. I hinted earlier that the mainstream music services are beginning to include more and more independent music. Even the rare stuff. What Spotify, Pandora, Rdio etc. still don't have, or likely ever will have, is the uploader/community support to truly keep up. Those services are never likely to have that bootleg recording of The Stone Roses at Spike Island, or the White Label rave classic New Science EP by D.S.K.F, or that user-uploaded DJ mix. YouTube does. It's arguable that these videos are just on YouTube anyway, and not part of Music Key per se. Except that they can be downloaded for offline listening, and played in the background on your phone -- services only Music Key customers can enjoy. Non-music videos don't enjoy these features. These videos are very much a part of the Music Key experience. The new service isn't perfectly harmonious, though. I noticed several non-music videos that incorrectly had some of the Music Key premium features. For example, this (unofficial) Mark Ronson track and this martial arts video from the same uploader show up as being available for offline listening -- because both contain a music track, just in different contexts. YouTube tells me that part of the goal of the beta period is to iron out kinks like this. Data from partners, and the invited music fans will give feedback as to what is and isn't a music video. I just hope that doesn't cull a lot of the gems from the service. That's a distinct possibility given that YouTube also advises me that these channels/copyright owners will need to sign a new agreement to have all features from the music service enabled (so if they don't, that music might no longer be available with the premium features). Both artist's music, and live performances are available without adverts -- just like your own music collection. There are other wrinkles Music Key needs to iron out, too. There's no consistent audio quality like you'd expect on conventional streaming sites (or option to set a minimum quality, for example). The curated playlists at launch felt a little thrown together -- no "Buns of steel workout" should feature Savage Garden. Using Music Key with the mobile app can also feel a bit buggy -- on a few occasions it totally forgot where I was in a playlist after I unlocked my phone, and dumped me back a few tracks. Music can also stutter when you switch from background playback to watching the video in the app (as it goes from audio only to video). The UI sometimes feels a little odd too, when, after all, you're basically just searching YouTube -- which wasn't designed with music playback in mind. A related positive, however, is that I found music discovery to often be better than the big-name competition. Because YouTube's recommended videos offer up a slew of user-generated related content, they are usually way more on the money than I've found in Google's own Play store (for example). Google now has the most complete music offering possible on planet earth. The bottom line is simple: with the forces of YouTube and Play combined, Google now has the most complete music offering on planet earth. Whether you're into garage bands or Disney soundtracks, there's likely something to your taste. 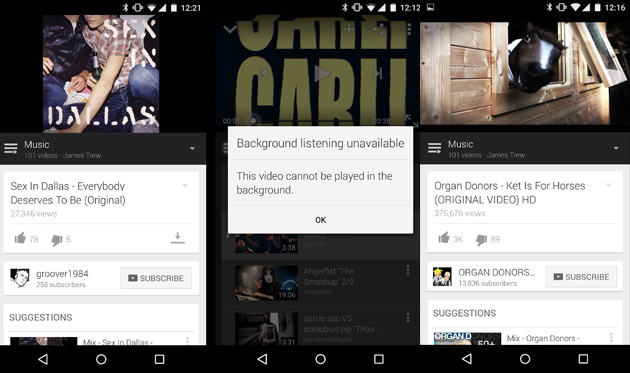 But, there's also the obvious fact that all of this YouTube music is available to anyone, for free, right now. There's no need to pay $10 a month, unless mobile playback, and lack of adverts is important to you (or you were on the brink of subscribing to Play, and this is just a sweetener). Spotify's success might not make it hugely profitable, but it does show there are customers willing to pay for such thing. It's just a question of whether there's enough to get those not currently served by streaming services to consider changing their listening habits. So far? It looks like there very well might be.